This organisation is sure causing some buzz here and there. 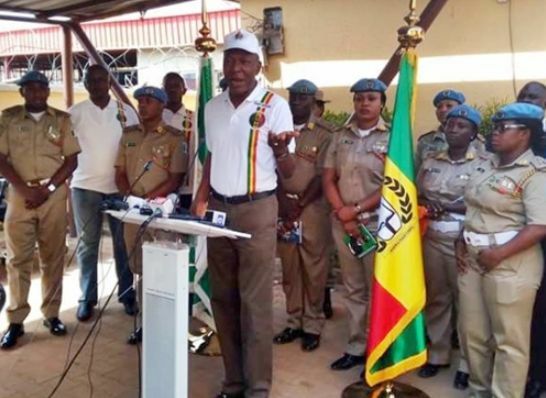 The Peace Corps of Nigeria on Thursday won its N2bn Human Rights Suit instituted against the Inspector-General of Police, Ibrahim Idris, the Nigerian Police Force and 4 others. This was even as the presiding Judge, Hon. Justice Gabriel Kolawole also gave a 7-day ultimatum that the National Headquarters of the Corps located at No 57 Iya Abubakar Crescent, off Alex Ekwueme way, opposite Jabi Lake, Jabi, Abuja, be unsealed. National Commandant, Amb (Dr.) Dickson Akoh and 49 other officers of the Corps who were arrested on February 28th, 2017, had approached the court, through their Lawyer, Chief Kanu Agabi (SAN), seeking redress over their unlawful arrest, detention and brutality. And they've won.